David Speedie attended this important three-day conference and reports that 600 official delegates from 83 countries (with the notable exception of the US and the UK) articulated a range of country/area-specific concerns, from the independence movement in Western China, to piracy, to "frozen conflicts" in Europe. The obvious crisis point at present is that of European security. A non-Russian delegate chided the 'U.S. insistence on a 'with us or against us' [dichotomy]' as a barrier to a 'true global coalition' against international terrorism. David C. Speedie is a senior fellow at Carnegie Council for Ethics in International Affairs. He is director of the Council's program on U.S. Global Engagement and also a founding member of the American Committee for East-West Accord. 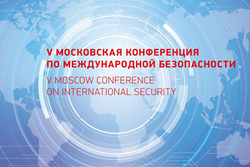 In April 2016, Speedie attended the Fifth Annual Moscow Conference on International Security, organized by the Russian Ministry of Defense. The conference had over 600 official delegates from 83 countries. They articulated a range of country/area-specific concerns, from the independence movement in Western China, to piracy, to "frozen conflicts" in Europe. "There were two principal takeaways from the packed three-day agenda," writes Speedie in his short report on the conference. "First, there is much going on, in terms of intergovernmental cooperation, which is not noticed or reported in the U.S. media. Second, this was by no means (as one had perhaps feared) a 'United States-bashing' session. "The obvious crisis point at present is that of European security. A non-Russian delegate chided the 'U.S. insistence on a 'with us or against us' [dichotomy]' as a barrier to a 'true global coalition' against international terrorism. Russian concerns were also expressed by two well-connected and internationally respected scholar-experts, Sergey Rogov and Alexei Arbatov. Rogov spoke of the need for the United States and Russia to 'get back to the 1972 agreement' on avoiding incidents at sea, with NATO ships 'nearing Russian borders' [in the Black Sea]; to revive serious discussion—and to get beyond mutual accusations—on the Intermediate Nuclear Forces Treaty; and to promote dialogue between NATO and the Russian-led Common Security Treaty Organization on terrorism, narcotics, and other common threats. "All in all, the conference was a positive and inclusive exercise," concludes Speedie, "with the non-presence of any official U.S. representative a symptom of the current general absence of constructive engagement, even on critical issues of shared interest, such as terrorism. This was not merely a gathering of Russia-friendly nations. There were delegates from the Scandinavian countries, France, Germany et al; the most notable absentees were the United States and the United Kingdom."